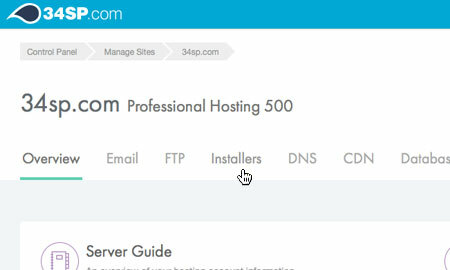 This is a quick step-by-step guide to installing WordPress via the 34SP.com Control Panel. WordPress is the world's largest and most popular blogging platform, used by tens of millions of people every day. The versatility and practical nature of the WordPress content management system make it ideal for bloggers or businesses to get started with a professional website quickly and add features as needed. For more information please visit wordpress.org. The 'One Click Installers' page provides a list of the different installers you can install on your 34SP.com account. 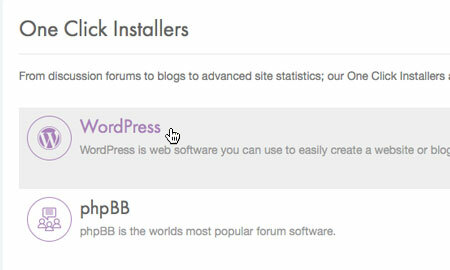 To continue installing WordPress, simply click on the 'WordPress' icon. This will bring up a form. Choose the domain or sub domain you wish to install WordPress to. 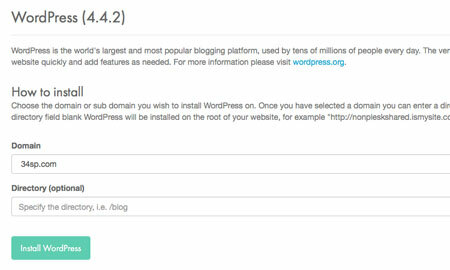 Once you have selected a domain you can enter a directory that you wish to install WordPress to, for example "/blog" will install WordPress to "http://www.yourdomainname.com/blog". If you leave the directory field blank WordPress will be installed on the root of your website, for example "http://www.yourdomainname.com/". When you're done, click 'Install WordPress' to begin the installation. Please note: The WordPress installer will overwrite any existing content in the directory or path it is installed to. 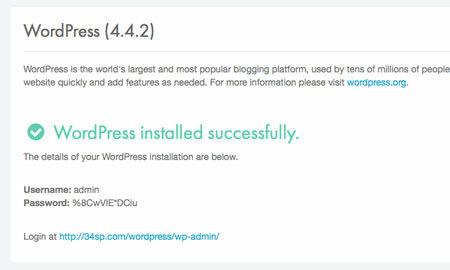 After you have clicked on the 'Install WordPress' button, the installation process will begin. Upon completion, the message 'WordPress installed successfully' will be displayed. The installation process is now complete. To start using WordPress simply follow the login link and enter the username/password provided.